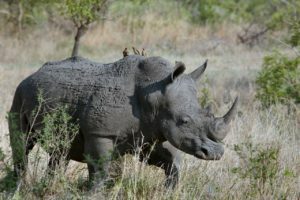 The Indian rhinoceros also called the greater one-horned rhinoceros and Asian one-horned rhinoceros is shortlisted among vulnerable species. It is fourth largest animal in the world and primarily found in parts of north-eastern India and in protected areas in the Terai of Nepal, where populations are confined to the riverine grasslands in the foothills of the Himalayas. The Indian rhinoceros weighs between 1,600 to 3,500 kg (3,500 to 7,700 lb). Asian one-horned rhinoceros belongs to the___________ family. The black horn, like human fingernails, is made up of pure ___________. What is the longest record of the length of horn of an Indian Rhinoceros? The interval between births by Indian Rhino ranges from _______ months. Which state in India has one-horned rhino as the official state animal? Rhino hunting was prohibited in India since……..